Banff & Buchan MSP Stewart Stevenson has welcomed the announcement from Postcomm that it is proposing to reject Royal Mail’s zonal pricing application. Mr. Stevenson has previously declared his opposition to this proposal in a Department of Trade and Industry consultation in March. The proposal by Royal Mail to charge different prices for business mail depending on where in the UK the mail is being delivered would have been seriously detrimental to rural areas. "This is a fantastic victory for common sense. The zonal pricing proposals would have seriously undermined the principle of the universal service obligation, which is so important to rural and remote areas of Scotland. "The proposed restriction to Royal Mail's universal service obligation would have primarily affected business mail, resulting in companies paying more to send mail to remote areas. This would have threatened the economic backbone and therefore the whole viability of rural town lands, villages and communities in Banff & Buchan and across Scotland. "We have already suffered the loss of many rural post offices and many more are likely to go under the current review. The loss of mail services that would have inevitably followed the introduction of zonal pricing would have been another serious blow to rural areas of Scotland. "Postcomm must keep their nerve on this issue and stand up for rural Scotland by continuing to reject this damaging proposal". Banff & Buchan MSP Stewart Stevenson is very pleased that Scotland’s Government has set out its agenda for a new generation of affordable housing in Scotland. Minister for Communities Stewart Maxwell MSP outlined the Government’s intentions to maximise the number of new homes built across Scotland. Mr Maxwell set out his vision at the Chartered Institute of Housing Scotland's conference on the future of social housing. The Minister will shortly host a Housing Task Force to address land supply and planning issues before inviting contributions on the best way forward in the autumn. "I am very pleased that the new Government has put affordable housing at the top of the agenda. "One of the most common issues raised by my constituents is that there is a distinct housing shortage which needs to be addressed. Young people in particular are finding it increasingly difficult to get on the property ladder. "I welcome the Minister’s moves to open up dialogue on the issue, which will hopefully ensure that the towns in Banff & Buchan retain a young population who can afford to buy homes in the area. "I welcome the Scottish Government’s proposals to put in place sustainable reforms which will ensure the projected future demand for affordable housing will be met." Banff & Buchan MSP Stewart Stevenson has welcomed the announcement by Cabinet Secretary for Rural Affairs Richard Lochhead to abandon plans brought forward by the previous Labour/Liberal Scottish Executive which would have forced agricultural shows and sheepdog trials to apply for special licences. A key part of the SNP’s election manifesto commitment to the agriculture industry was the reduction in red tape and Mr Lochhead has stated that shows and exhibitions will now be exempt from the requirement to apply for a licence except for those where stock are to be bought and sold. “With the summer show season in full swing, I am sure this news will be welcomed by show committees across the North-east as a common-sense move. “We need to remember that these events, which have been around for well over a hundred years, are organised by volunteers. If the burden of paperwork becomes excessive then people may simply give up and we would then be in danger of losing these important parts of our heritage. Banff & Buchan MSP Stewart Stevenson is appealing to his constituents to involve themselves in the ‘It’s Your Community’ scheme. Communications company, O2, is contributing to the development and sustainability of society, by enabling its customers, local people and employees to make a difference by contributing to local projects to improve constituents' local communities. “If you could change one thing about where you live, what would it be? There are a huge range of groups and projects in Banff & Buchan, which are more than worthy of this award and I would encourage any such project to apply. “Turning derelict land into a playground, planting trees where none grew before, turning an abandoned building into an arts centre for young people. These are all ideas for projects. 'It's Your Community ' is a new awards programme to help people come together to make a real difference to the communities in which we live. “Awards of up to £1000 are available to local groups and individuals, for anything that you can show will benefit your community. Whatever your idea, simply fill in the form and do your best to persuade O2 . The awards themselves are administered, assessed and judged by the Conservation Foundation. If you have an idea, don't hold back - see what you can do. “O2 wants to contribute to the development and sustainability of society, by enabling its customers, local people and employees to make a difference. The big idea behind the 'It's Your Community' programme is this: if you could do one small thing to make your community a better place, what would it be? By enabling lots of small groups to make a difference across our country the collective impact will be much greater. Transport Minister, Stewart Stevenson has today welcomed the contract award for the delivery of a major A9 upgrade in the far north of Scotland. RJ MacLeod has secured the 12-month contract to construct 2.1 kilometres of new trunk road at Helmsdale in Caithness to replace the existing section which has poor alignment and no overtaking opportunities. “This is vital work which will improve safety on the A9. It will bring economic benefits to both the north of Scotland and the northern Isles, bringing improved connections for locals, businesses and tourists, as well as providing an important link with the Scrabster ferry terminal. “Far north communities will be delighted that this multi-million pound investment in their infrastructure is moving forward. “Last week we saw work begin on the Ballinluig stretch of the A9, now we are seeing a contract being awarded for work to begin on the Helmsdale stretch. Both of these schemes have road safety on the A9 at their very heart - a key priority for this Scottish government. “I said that I would look at doing everything I can on the immediate priorities for investment to tackle the death toll on this road in the short term, and that is exactly what we are doing. In the long term, we still remain absolutely committed to plan for dualling of the A9. The Helmsdale scheme will construct 2.1 kilmetres of new road between East Helmsdale in the South and Allt Briste in the North. A new roundabout will be constructed at the southern end of the scheme that will allow safe access to properties at Navidale, while new junctions will be provided to Navidale Cemetery Road and Navidale House Hotel. To the north, overtaking provision will be provided along a 280 metre section that will tie in to the previously constructed Helmsdale phase 1 scheme. The de-trunked section of the A9 being replaced by the scheme will become a footway, cycleway and access track. Work is due to start at the end of August. Drivers are asked to show due care while work is being delivered, particularly at the southern end of the scheme where the roundabout will be constructed. A £15 million junction improvement on the A9 at Ballinluig, Perthshire is now underway, while a £29 million package for the lower Highlands section of the A9 to the south of Aviemore is programmed to take place in coming years to deliver overtaking and maintenance upgrades. Police forces across Scotland have combined in a summer road safety campaign targeted on the 'persistent miniority' of motorists who think they can ignore the drink drive limit. "We have all seen the devastating effects caused by those who drink and drive. Every day it seems people are prepared to take a risk in the misguided assumption that it either won't happen to them or that they won't be caught." "There is still a persistent minority of drivers who believe they can have a few drinks and be fit to drive. It seems people who drink and drive believe the risks of killing, being killed or getting caught are low. "The evidence clearly points to the contrary. One in seven road deaths in Scotland is a result of drink driving. "Police forces across Scotland are always vigilant to drink driving, but this campaign means you're more likely than ever to be stopped, breathalysed and prosecuted." A new trial hovercraft crossing of the Firth of Forth was officially launched today. The Stagecoach service between Kirkcaldy in Fife and Portobello in Edinburgh will carry up to 130 passengers at a time, starting from Monday July 16. "This is an innovative trial which has the potential to change the way people travel between Fife and Edinburgh. If we are to tackle congestion on Scotland's roads and encourage people out of their cars, we must give people a wide range of public transport choices. "This trial gives people that added choice. I hope as many people as possible take advantage of the hovercraft service and make this trial a success." The £300,000 trial has been part-funded by the South East of Scotland Transport Partnership (SEStran). It will offer a 20 minute crossing time, using a 28-metre BHT130 hovercraft, incorporating the latest diesel engine technology. A total of 22 services a day - 11 in each direction - will operate on the route, with peak-time services and integrated bus links. "Public transport has clear environmental benefits over the car and we are very excited by the potential of the hovercraft service. The hovercraft can help shorten journey times for commuters and we also believe it will appeal to leisure travelers based in Scotland and tourists visiting from overseas. "We have had huge support from statutory organisations and the local community for the service and we will be working closely with a range of partners to study the results of the trial in due course." "SEStran is supporting this trail with £92,000 of funding because we believe the service can make a useful contribution towards our objectives of cutting single occupancy car journeys and reducing pollution." To prepare for the trial, temporary landing facilities have been put in place on the beachheads at Kirkcaldy and Portobello. A special plastic landing surface, security fencing and screens have been constructed at the sites, and further work will be carried out at the end of the trial to restore the beachheads to their original condition. Scottish Natural Heritage has approved the pilot project and Stagecoach will be carrying out ongoing environmental impact studies, particularly in relation to bird life, Fife and City of Edinburgh Councils have also given support to the project. Banff & Buchan MSP Stewart Stevenson and his 'local hero', Andrew Webster of Little Whitefield, Forglen, Banff, Secretary of Friends of Forglen Community Hall, enjoyed a day of celebration at the official opening ceremony of Parliament on Saturday, 30th June. Mr. Stevenson and Mr. Webster took part in the traditional riding procession to the Scottish Parliament alongside other MSPs and their guests. Her Majesty The Queen, HRH The Duke of Edinburgh, Presiding Officers and the First Minister greeted the arrival of the riding procession in front of the Scottish Parliament building to welcome in the new session of Parliament. 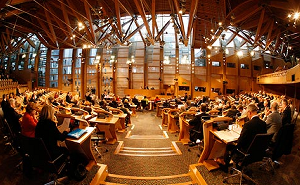 "The whole day was a spectacular celebration of the Scottish Parliament's third term and fitted the atmosphere extremely well. All aspects of Scottish culture and life were represented at the ceremonies and it was a particularly memorable occasion for all the local heroes involved and the public who came along to witness the event. "I was delighted to have Andrew with me as my local hero, as through his work with the Friends of Forglen Community Hall he has contributed hugely to the community of Forglen. His dedication is highly commendable and very deserving of this tribute. "I personally thoroughly enjoyed the experience and I am looking forward to a third term where cooperation and effective decision making will be the defining features of Scottish politics."